“Servant - Soldier: Complete Article Collection” from Christian Faith Publishing author Michael Galloway is an inspirational book based on the experiences of the author in order to help others live in accordance with God. “Servant - Soldier: Complete Article Collection”: is a guidebook for readers to better live their lives in accordance with God. “Servant - Soldier: Complete Article Collection” is the creation of published author, Michael Galloway, grew up in the rural Midwest and was brought up in the Methodist church, later the author would serve with the Navy. Published by Christian Faith Publishing, Michael Galloway’s new book helps readers live closer to God through the personal experiences that Galloway has had in life. Though service to country, community and God, Galloway has lived a fulfilled life and wishes to share that with others. In a series of stories and anecdotes regarding the author’s personal views on faith, readers can learn more about themselves and religion as they receive some of this former serviceman’s wisdom. View a synopsis of “Servant - Soldier: Complete Article Collection” on YouTube. Consumers can purchase “Servant - Soldier: Complete Article Collection” at traditional brick & mortar bookstores, or online at Amazon.com, Apple iTunes store, Kobo or Barnes and Noble. 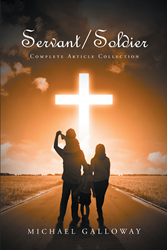 For additional information or inquiries about “Servant - Soldier: Complete Article Collection”, contact the Christian Faith Publishing media department at 866-554-0919.